Laguna Beach, California is a small coastal city located south of Los Angeles. 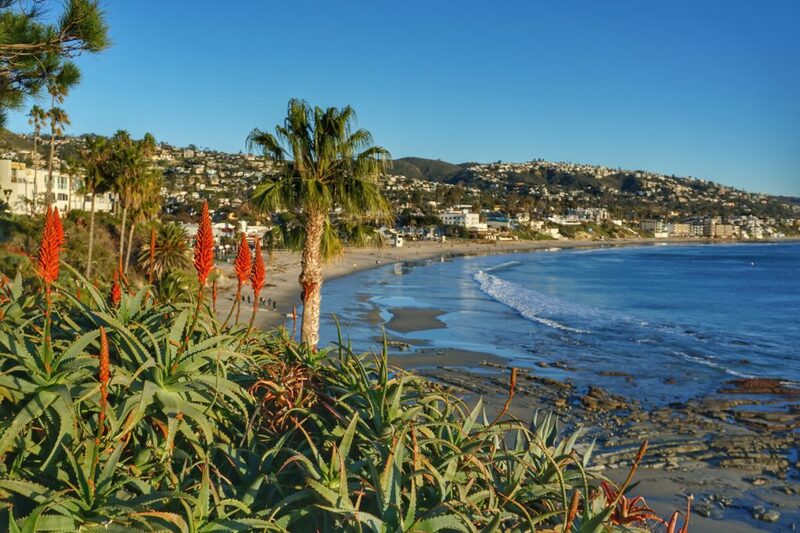 It is well-known for the beaches, art galleries, tide pools, and of course the TV series, Laguna Beach: The Real Orange County. There are many tourist spots in Laguna Beach to visit and dine at during your time in this relaxed, friendly city. Here are just a few favorites that would be a shame to miss on a 3 day California road trip. In the heart of downtown Laguna lies the “Window to the Sea.” Main Beach is the perfect place to go for a leisurely walk, have a picnic, play some sand volleyball, or take in the sights. This top tourist spot in Laguna Beach is something that everyone must see while in the area. Heisler Park is one of our favorite tourist spots in Laguna Beach. It is near Main Beach and is beautifully stretched over the cliffs and the ocean. It’s also a great spot to go for an afternoon stroll or take in the cotton candy or vibrant sunsets that are notable at Heisler Park each day. 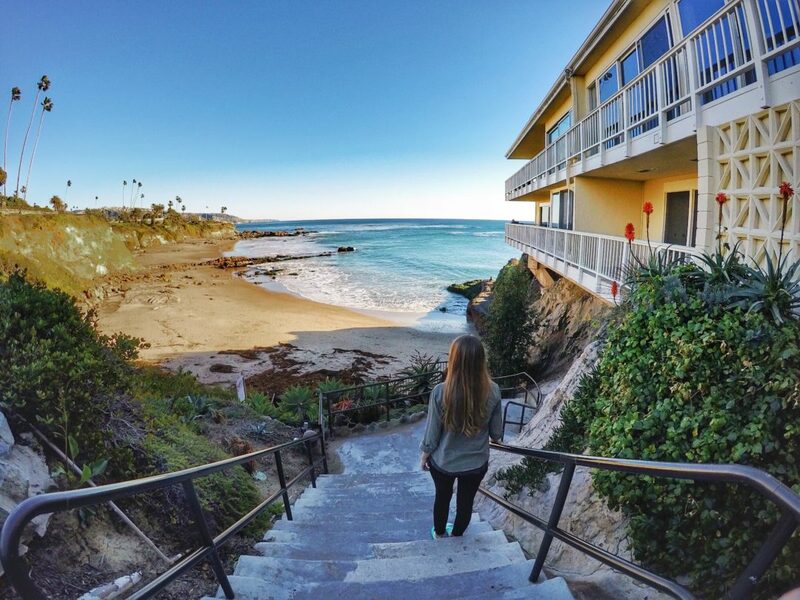 One of the nice things about this tourist spot in Laguna Beach is you can stay for as little or as long as you want, but trust us… you’ll be back! 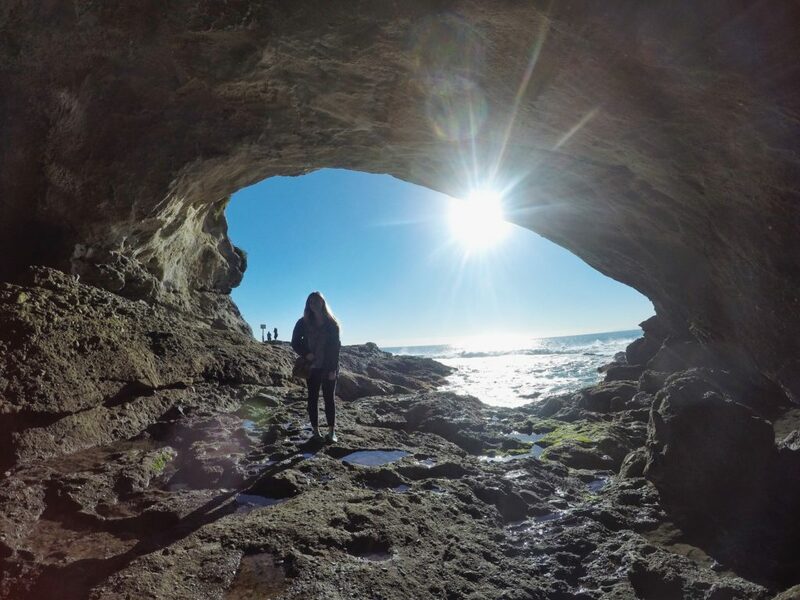 It would be easy to think you somehow made it to Treasure Island while visiting this tourist spot in Laguna Beach. The Pirate Tower at Victoria Beach has a fascinating history but you could also come up with your own story to tell. The tower was built in 1926 as an enclosed staircase to the beach for a California senator. Later, the senator sold his home to a retired naval captain, Harold Kendrick. Kendrick would dress in a pirate outfit and invite people over for stories and scavenger hunts. 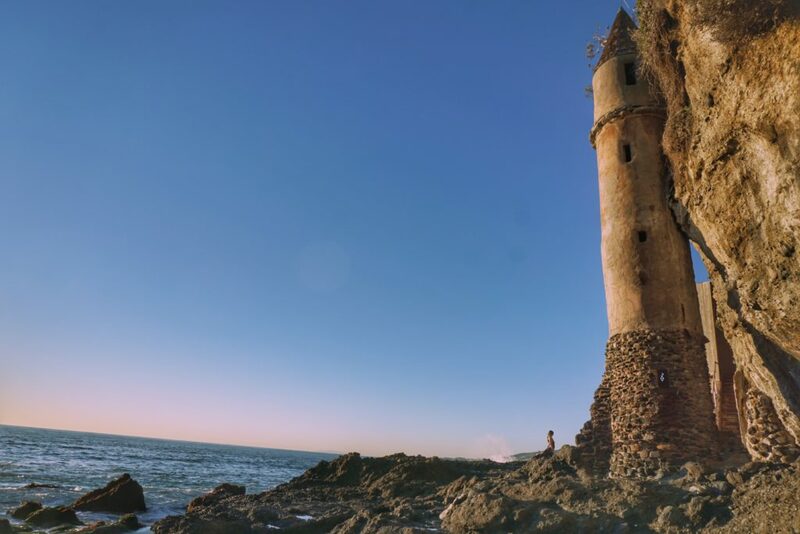 Today you can visit the Pirate Tower during low tide and imagine it as Rapunzel’s famous tower or that it is a part of a castle that once stood. Upon arriving at this tourist spot in Laguna Beach you’ll find a steep staircase covered in vines. After making your way down this one way down and one way up staircase, you will reach 1,000 steps beach. On the beach, you’ll see a cove to your left in which you will find two caves to explore! Inside we found many tide pools and enjoyed hearing the soothing sound of the waves crashing on the rocks. Be sure to wear proper footwear if you are planning to climb in the caves, otherwise enjoy the beauty of the beach as there is much to see there too! Visiting the caves at 1,000 Steps Beach. All around the Laguna Beach area, you can find many tide pools. Each location is different from each another featuring different sea creatures that can come and go as they please while others have made this their permanent home. 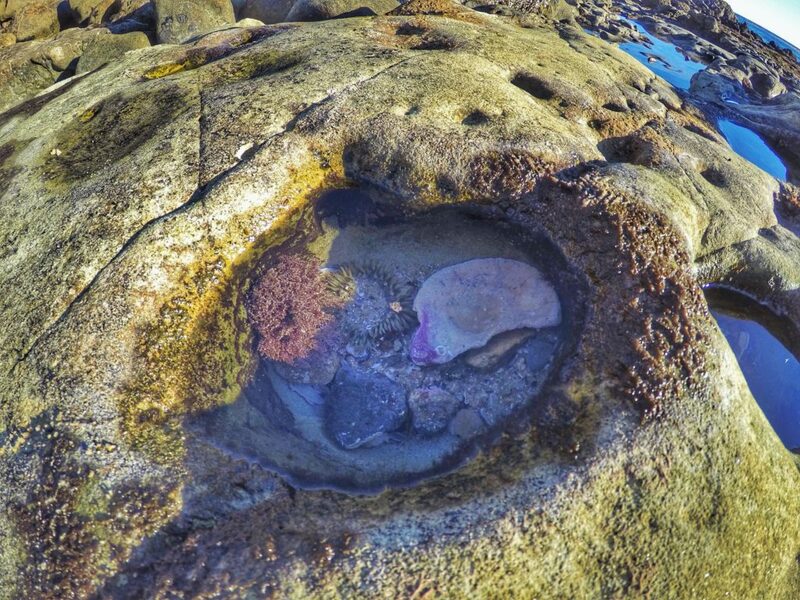 If you are planning to visit the tide pools in Laguna Beach make sure you follow some simple viewing guidelines so you do not hurt or destroy the homes of these fragile ecosystems. Do not touch or take any living or non-living items from the tide pools and be very careful where you step while climbing on the rocks. Tide pools are only accessible during low tide so make sure to plan accordingly! It was so cool seeing the tide pools in Laguna Beach! Address: 8471 N Coast Hwy. Another top tourist spot in Laguna Beach is in nearby Dana Point. You’re in for a treat if you take a cruise with Captain Dave! This whale watching tour is up close and personal as you can experience ocean life in a variety of ways. Climb to the bow to be able to see whales swimming gracefully and dolphins jumping and playing right in front of you. You can also head to one of the underwater viewing pods to see what lies beneath the waves. Each season brings in different sea creatures so be sure to look into the whale spottings on Captain Dave’s site! 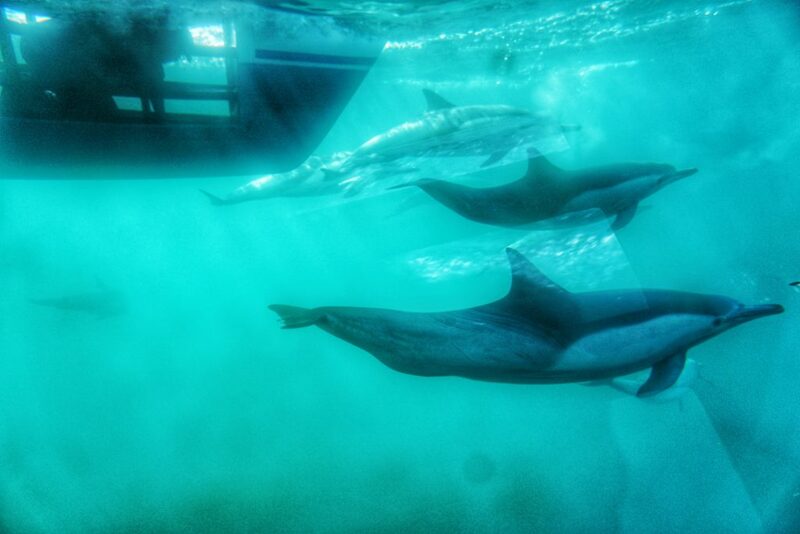 Some dolphins we saw during our boating excursion with Captain Dave. Arrive roughly 30 minutes prior to your scheduled tour. Take Dramamine (or other medicine) if you suffer from motion sickness. Prepare to get wet if you stand near the bow! Bring a lightweight jacket as it can get windy when the boat is moving. Balboa Island attractions are a favorite pastime for many that are still thriving. We took an uber over to the ferry loading zone then the ferry to the island for $1 one-way. 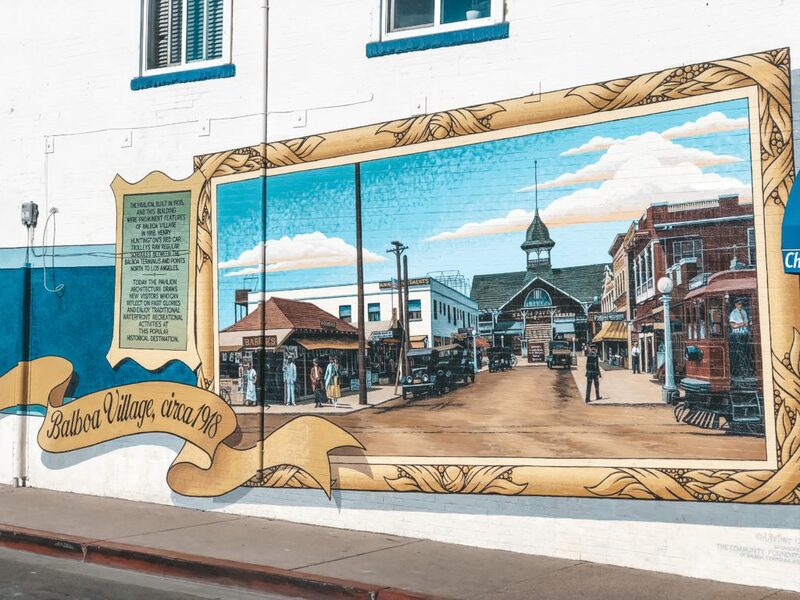 While on the island stop at the coastal shops for some souvenirs and get tickets to some of the rides at Balboa Fun Zone, one of the most popular family attractions in the Newport Beach area. Don’t forget to get a chocolate covered frozen banana, the island specialty treat! Ruby’s Diner is a 1940’s style diner chain that is known for its American fare and thick milkshakes! We loved the vintage charm of the classic cars out front and the beboppin’ oldies music. 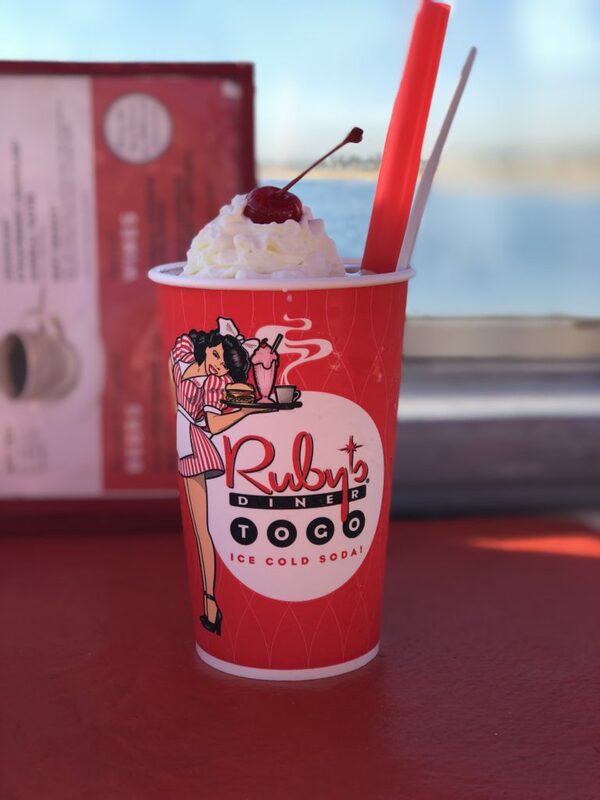 While there are many locations to enjoy this Laguna Beach attraction and get a shake from Ruby’s, we have visited the location on Balboa Pier which is perfect if you happen to be visiting the Balboa Island attractions and there is also one in the heart of Laguna Beach. History buff or not, you’ll be fascinated by the beauty and story of this nearly 250-year-old mission. 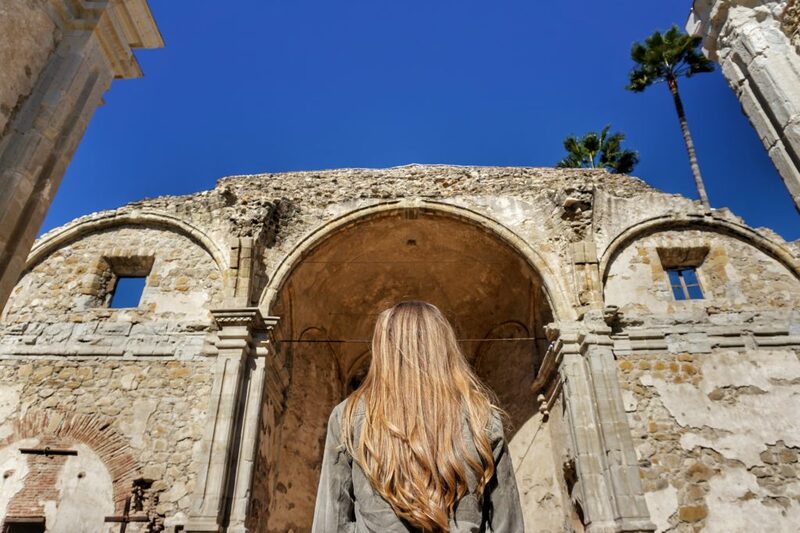 Its story begins in 1775 when Mission San Juan Capistrano was first founded by Father Lasuen. It was established to expand the territorial boundaries of Spain and teach the native people about Christianity. The mission is now run by the Catholic Church as a non-profit organization and has an impressive historical tour and beautiful architecture to view during your time at this tourist spot in Laguna. The Beachcomber has incredible brunch and lunch options with a really fantastic view of the ocean. We loved the shrimp pasta and soup and salad combinations. One thing’s for sure, don’t leave without getting some beignets to share. They may not be from New Orleans, but they’re still dang good! 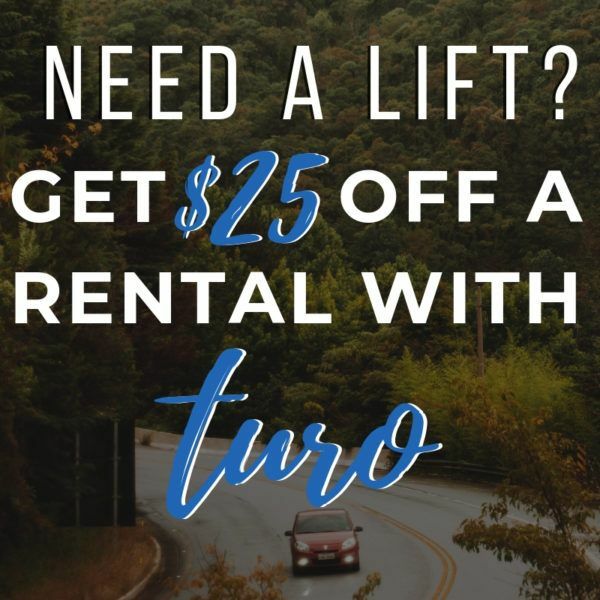 How can anyone not love free transportation? 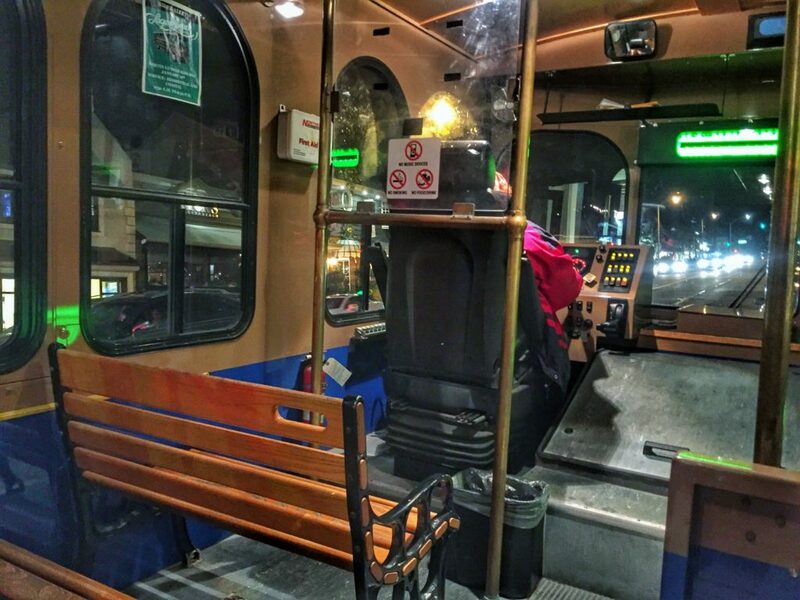 Every day in the summer and every weekend in the winter months Laguna Beach offers their trolley services to get you to all of the top tourist spots in Laguna Beach. Wanting to get a good view of the city? 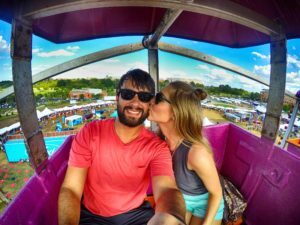 Ride the loop from start to finish! Hours of Operation: Fridays: 4pm-11pm, Saturdays: 11am-11pm, Sundays: 11am-8pm, July & August the trolley runs daily from 9:30am-11:30pm. Golden hour is something special in California. One day you’ll have a warm, glowing sunset; the next day will be cotton candy skies. One thing’s for sure… be sure not to miss a second of it! 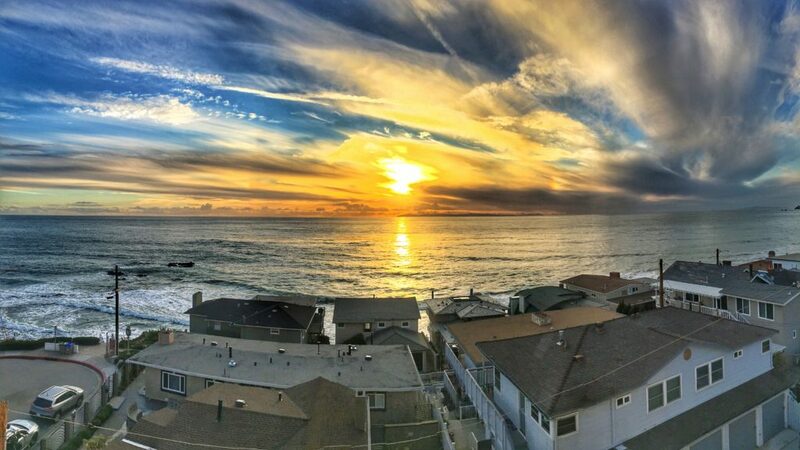 One of the best places to view sunset in Laguna Beach is from the Rooftop Lounge. 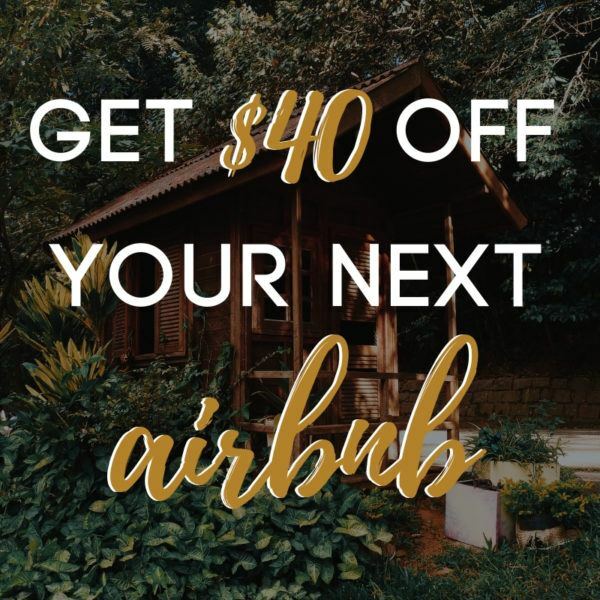 The Rooftop Lounge is located on the top floor of the La Casa del Camino hotel so be sure to get their early to snag a spot at this tourist spot in Laguna. 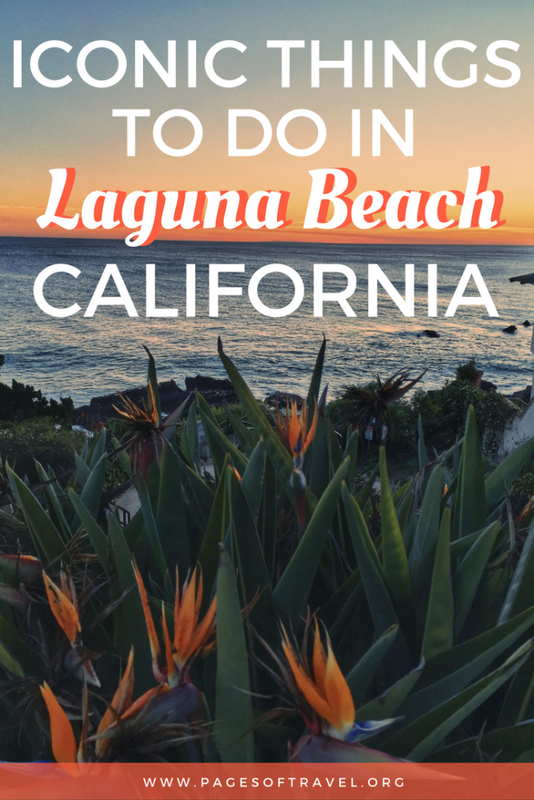 Regardless of what is on your California road trip itinerary, don’t miss these tourist spots in Laguna Beach! I had no idea! We still haven’t made it over to the Philippines but would love to visit. 🙂 Thank you very much for the comment! I enjoyed Kendrick story in Pirate Tower at Victoria Beach. Great find you guys. I’m a sunset lover myself and must admit, that sunset looks magnificent. If that’s taken from your home, am sure you know you are so lucky. If not, still a great capture, love it! We don’t currently live in Cali. However, those lucky enough to live there have such a treat each day with the sunsets. They are some of the best we’ve ever seen! Thank you Anna! Great post. I really love the story of the Pirate Tower! Sunsets tend to be so magical, I wouldn’t miss one for sure! Ooh those caves look awesome! I bet that is a beautiful scene at sunset/sunrise. Your pictures are amazing! My father, recently a Filipino immigrant, lives in Laguna Beach. He said it’s a beautiful place, and by looking at your photos, he is absolutely right! The tidal pools and the sandy beach is awesome! We would love to go out there during the sunset and explore treasures that sea leaves behind as the tide recedes. Well, we’ll just cross our fingers. Going to the US is quite expensive for us considering that our peso is considerably weaker than the US dollar. Also, our Philippine passport is a weak one, and it’s difficult to get a visa to the US. I would love to get to the West coast! Laguna BEach looks like a great place to start!!! The cakes looks amazing! I have only visited Thousand Steps Beach from your list so I am excited to try the others! I am a sucker for dolphins so Captain Dave’s boat sounds awesome! I have never been on a dolphin watch with a boat that has underground views. That sounds and looks so exciting! It was quite thrilling! At first my sister and I were worried we wouldn’t see any whales or dolphins but after searching we came across the pod of dolphins (had to be thousands of them) and we both were squealing with delight! Definitely a must next time you’re there. I have never seen the TV show but have heard of it before. I can see why they would want to set it there since it looks absolutely stunning. Looking on the beach in the tide pools sounds like a lot of fun. What a great place to visit in California. I personally haven’t watched it either but had a few friends that swooned over it! I can see it being the perfect place to film a movie or tv show as well. Thank you! This looks like an amazing place! I’ve never been to California, but Laguna Beach has always been at the top of my list. The pirate tower looks like it’d be such a cool thing to visit- thanks for all of the great info! As a native Southern Californian, I just love seeing posts like this! I haven’t spent a lot of time in Laguna, but have bookmarked this page for my next trip home. Your pictures are awesome, too! 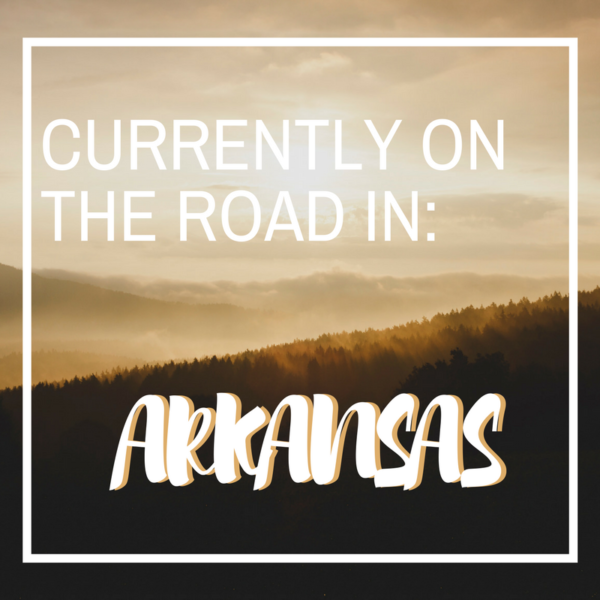 Such a great tips and I’m glad that you seemed to have fun in my home state! I have always wanted to visited the pirate tower, it looks so cool. Someday I will have to take a trip over there just to see it. What about watersports? Surfing or/and kiteboarding? These photos are absolutely stunning!!! I’m looking to revisit LA this upcoming September and I’m so glad I got a chance to read your blog. Definitely adding this to my trip itinerary as well and I can’t wait. Thanks for sharing! Thank you Jas! 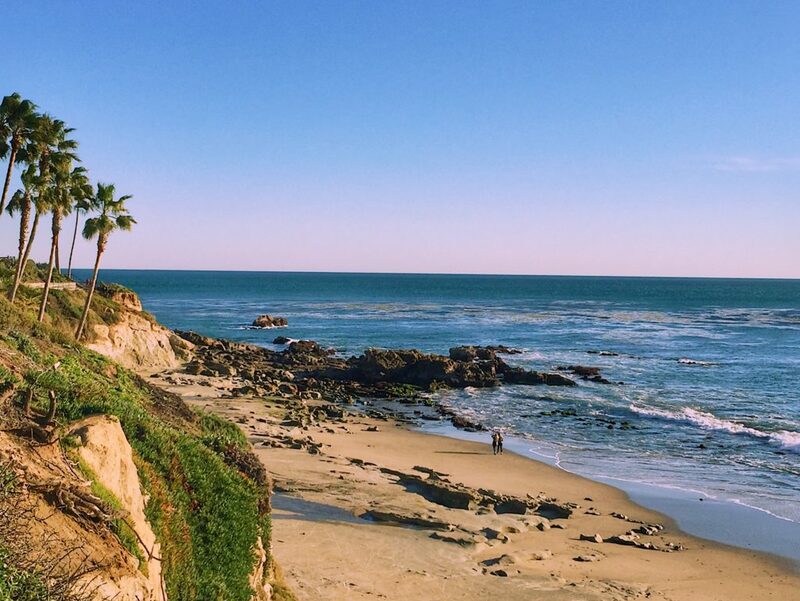 Laguna Beach is so close to LA that you have to add it to the list. So glad you agree! Thanks for reading.